Last night the prefect, Nicole Klein, announced the end of the eviction operation. But the cops are still there and there is a call to retake the sites that were already evicted. If you want to contribute to our live blog; You can send your pictures, videos, reports and analysis. Go to our submit page: here. Click at the refresh button of your browser to get the latest information. Live Blog in French: here. ZAD Pirate radio: here and here. Our Live Blog ZAD eviction Day 1 from, April 9 is here. Our Live Blog ZAD eviction Day 2 from, April 10 is here. Our Live Blog ZAD eviction Day 3 from, April 11 is here. Our Live Blog ZAD eviction Day 4 from, April 12 is here. We will stop our live coverage for today because we will travel to France now to start with on the ground reporting from ZAD tomorrow. Thanks for reading! 04:34pm The cops are stopping cars at the boisetière in the direction of the south barricade of Rosier. 04:19pm Two armored vehicles coming down from the Ardillères to lama faché to do what …? And we wonder: According to the prefect the operations are completed! 03:52pm The ploermel collective is currently being nabbed by the cops in court as they were distributing leaflets to the market on the situation here. Solidarity from Barcelona to ZAD! ZAD: Barricade at Suez road. People are digging a ditch to stop the armored vehicles. 12:50pm The car of a farmer has just been searched and the cops seized tools on the road to la haie north west of ardillères (from fay to ardillères) He was able to continue and pich up his tools to at the police station in Blain late afternoon. 12:31pm If you want to come to ZAD: Coming from Fay de Bretagne via the d81, turn right at Le Bourget (sic!) To get straight to chêne des Perrières. It’s possible. Solidarity with la ZAD from Wiradjuri country, in so-called Australia. 11:00am Paris: Last night the cops evicted the occupied Sorbonne university. They also wanted to evict the occupied Tolbiac university but failed after massive resistance by students. Images from Tolbiac last night. 10:57am ARRESTS: Press release of the Rennes Public Prosecutor’s Office: The search that was conducted at “La Grée” was carried out as part of the investigation opened after the firing of a rocket on Tuesday, on a helicopter of the gendarmerie. “Several elements useful to the investigation” were seized, according to the Rennes Court of Appeal. Two people were also detained this morning, according to the court of appeal, “unrelated” to the rocket investigation. One was arrested at 4 o’clock for “acts of violence on a person holding the public authority”, the other for having “rushed on the gendarmes armed with a hammer” at 7:30. 09:34am Identity checks on the road from the Chêne des Perrières at Fay and the exit of the temple. Or did they decide to use it as a barricade to prevent the zadists from going by? Why do they keep on shooting? Because they are bored. “Fortunately” a second armored vehicle arrives to shoot first. According to the colonel of gendarmerie they would really like to go home … if they have not left by 20 minutes the vigilant tractors will be put in position. 09:17am AMBAZADA: the cops are still there, they claim that it is to secure the progress of the armored vehicle which is still clearing the Lascars barricade. 09:03am ROHANNE: Cops are combing the forest north of Suez Road, the passage is no longer possible. A new medical point was opened at Liminbout. 09:00am La GREE: except fifty, the cops leave the place to the north. It seems that they also have left the Chemin de la Noue. 08:32am SUEZ ROAD: the cops have passed the Lascars barricade and are now deployed along the road to the west. NEWS FROM THE PREFECTURE: taken from the article of the World “Emmanuel Macron, announcing Thursday that what” was evacuable was evacuated “, whistled the end of the operation of expulsions on the ZAD.But the tension remains live and the police will remain mobilized. This announcement is the concrete translation of what the Head of State said, during the interview he gave to TF1, Thursday at 13 hours. “The operation arrived at a point where everything that was evacuable was evacuated. There will be now, in the coming days, a work under the authority of the prefect which is to allow agricultural projects legal, organized, to be done, “said Emmanuel Macron. On the ground, after the violent clashes that pitted the mobile gendarmes for more than two days, 2,500 for the entire intervention, and hundreds of zadists, residents of the area backed by supporters came to join them, and after a day of Thursday a little calmer, the time is therefore to continue the work of clearing, but without any new expulsion. A total of 39 sites were reported to have been evacuated, most of which, at the time of the assaults, were empty of their occupants. All will be destroyed. The state can thus avail itself of a goal achieved, since the prime minister, Edouard Philippe, had mentioned forty sites to be evicted. The device could be slightly lightened as early as next week but, according to the staff of the gendarmerie, the grid will remain important throughout the area and clearing work will be protected, as well as both departmental roads, RD 281 and RD 81 crossing the ZAD. Nicole Klein, who had always said that the door was open, must specify Friday that it will “reopen the discussions with all those who want it on the ZAD” to revive the process of dialogue and regularization. That’s also what Mr. Macron suggested on Thursday. “I hope that the farmers who are on site, who have a project for this territory can develop it, but it is not the disorder and it is not the occupation by people who only seek to create the trouble, “he said. The end of the week will be scrutinized. Saturday, a demonstration against expulsions on the ZAD is planned in Nantes. It promises to be explosive in a city that remains marked by the clashes and the considerable damage caused on February 22, 2014, after a demonstration against the airport project. Ms. Klein confides to think about the possibility of prohibiting the large protest rally to be held in the grove of Notre-Dame-des-Landes Sunday. “We will look closely at how the event is happening in Nantes on Saturday and we will advise,” she says. 08:13am The sound of grenades: we wonder a little here if the immoderate use of grenades as offensive weapons is legal. 07:58am The cops retreat from Vraies Rouges and went back to their favorite position around Lama Faché. They really start to like this crossroads, will they ever leave them? 07:45am Big device also around Vraies Rouges. People are on the roof. 07:42am An armored vehicle attacked the “Lascar” barricadewhich protects the access to Suez road and Wardine. 07:39am The cops have taken position on the La Saulce crossingt, the barricades are on fire. 07:35am La Grée: about thirty people are being kept by cops, nassée, in the courtyard. One person was evacuated on a stretcher, we do not know more for now. 07:34am WARDINE: The cops are gone, after checking identities and searching bags of people on the campsite. 07:19am Surprise! The Prefecture lie! 2 minutes after the announcement that the operation concerned only La Grée we learn that the cops are on the campsite at Wardine, ask people not to leave their tent and control identities. 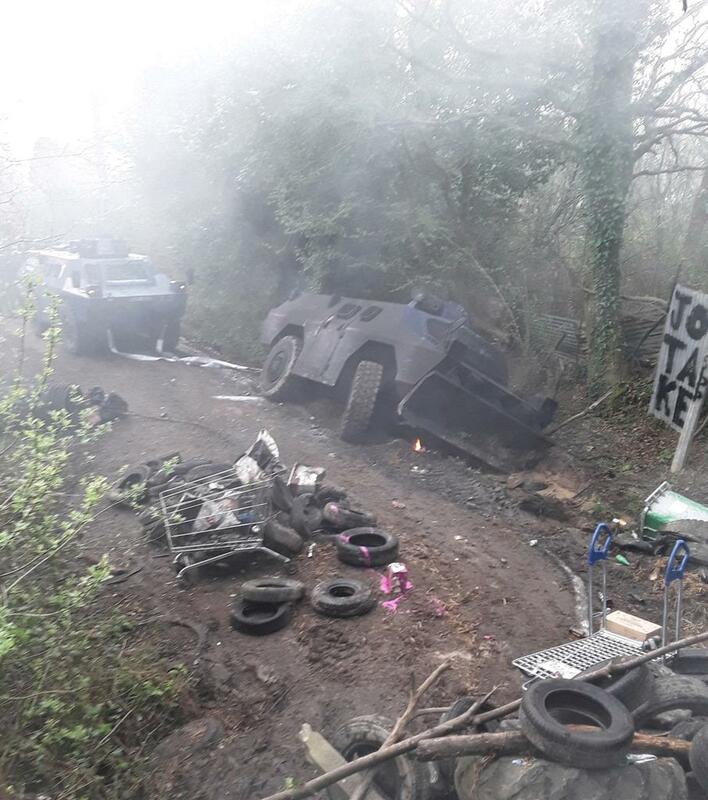 07:13am According to the Prefecture, the massive invasion of the zad in the early morning is linked to an operation requested by the prosecutor of the republic and the Judicial Police, in order to make targeted arrests, including at la Grée. We remain vigilant. 05:30am “I announce the end of the operations carried out by the gendarmes” declared the Prefect yesterday, at 10:00pm (22h), in West-France (article here). While we must remain vigilant in the coming days, it is only a word of policy … And the continuation is not going to be simple, it will be necessary to fight together to continue to defend what we want for the future in the zad. But they have been pushed back , even if they will always say the opposite! The rally of Sunday, April 15 on the zad is maintained, let us find many to defend the continuation! Next post: The time has come – Call for massive presence of people at the #ZAD!